The majority of Mabank is located in Kaufman County within the state of Texas. A portion of the town is located in Henderson County. Residents of Mabank celebrate their rich history and remain true to small town charm that so many find appealing. The population is approximately 3,224 people, with 91% of residents living in urban environments and 9% of residents living in rural environments. The area has seen significant growth in population over the last decade. With 2.97 square miles of land area, Mabank has a population density of 1,085 people per square miles. This is low when compared to the state average. The median home value in Mabank is $118,263. Home values are the area have doubled over the last decade, which is excellent news for home owners. The average household income is $39,050. The average income amount has also risen slightly over the last decade, and residents enjoy a stable economy. Mabank is a favorite destination for those who enjoy spending time on the lake. The Cedar Creek Reservoir is an inviting location for those who love to fish and enjoy water activities. Those looking to fish in the area will find several species of catfish, a variety of bass, and crappie. Students in this area are served by the Mabank Independent School District. This school district is comprised of three elementary schools, two middle schools, and one high school. Elementary schools are Central Elementary, Southside Elementary, and Lakeview Elementary. Middle schools include Mabank Intermediate and Mabank Jr. High. The high school is Mabank High School. The weather in Mabank is perfect for the many outdoor activities residents enjoy. The hottest month of the year is August, with an average high temperature of 94 degrees. The coldest month of the year is January, with an average low temperature is 34 degrees. Mabank is a charming community that remains true to the ideals that make living in a town of this size an ideal choice for those seeking lasting connections. There are numerous community managed events, activities, and sports opportunities. 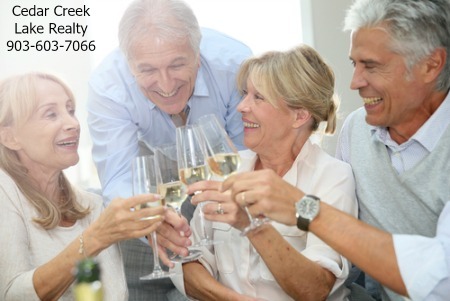 Current residents are proud to call Mabank home and you will, too! Give one of the Cedar Creek Lake Realty Team agents a call at 903-603-7066 to view available homes for sale in Mabank.